The Rusty Saw North in Brutus offers the traditional BBQ dishes – ribs, pulled pork, smoked chicken, brisket, sausage – along with some unique burger combinations like brisket patty topped with brisket, cheese and sautéed onions, a pork patty topped with bacon, pulled pork, sautéed onions and cheese… We offer sandwiches, salads, and wood burning stove cooked pizzas that have a BBQ twist – like one with brisket and one with their smoked sausage. The side options for the BBQ entrees include green beans, brisket baked beans, Carolina slaw, red beans and rice, and dirty rice. 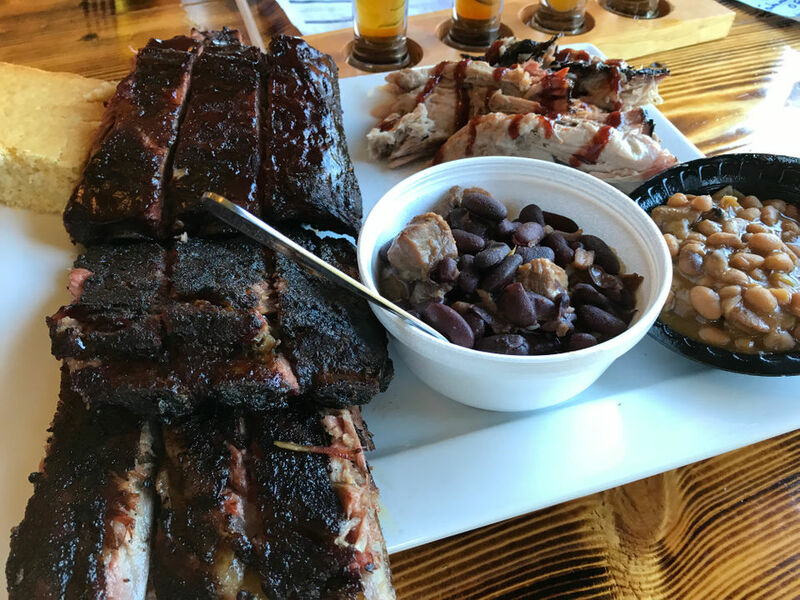 Our ribs are made two ways – the Friday night special with a Michigan Cherry BBQ sauce, and the Saturday night version with our house Memphis style dry rub. Yes, We have a full bar with 18 taps of Domestic and Craft beer and a great selection of spirits and cocktails. Rusty Saw North isn’t just a good “Up North” restaurant, Rusty Saw can fit in anywhere and be consider great Michigan BBQ. We are near Petoskey, Harbor Springs, Alanson & Pellston. Checkout out our menu by clicking below. You will be directed to a PDF version of our menu. Feel free to print it out and tack it on your refrigerator. If you want to place an order via phone, simply call 231-529-6574 during operation hours, and give us about 20-30 minutes before stopping by to pick up your order. Sometimes words can’t describe everything. So here are some ads that we believe describes who we are, what we offer, and what our customers are saying. Call 231-529-6574 to reserve your table. Whether you are looking for a small get-together or a full wedding reception, we strive for excellence at every moment. Celebrate at Rusty Saw North. Fill out this form. One of our team leaders will get back with you as soon as possible. When do you plan on having your event?